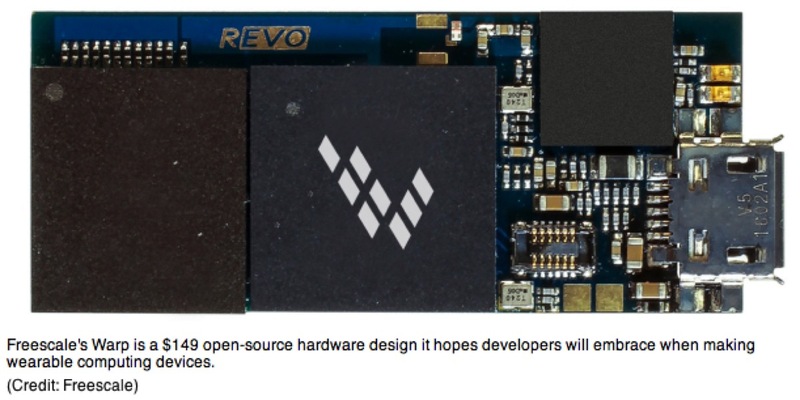 BREAKING NEWS – Chipmaker Freescale aims Warp at wearable computing devices #ces2014 #oshw « Adafruit Industries – Makers, hackers, artists, designers and engineers! Chipmaker Freescale aims Warp at wearable computing devices. Freescale Semiconductor, a maker of small, low-power processors, has announced an effort based on a $149, Android-powered, open-source electronics board to try to help hardware developers build its chips into wearable computing devices. Wearable computing has become the hot thing as companies seek to claim new territory in the tech market. The starting point is fitness devices, but smart watches like the Qualcomm Toq and eyewear like Google Glass offer more general-purpose possibilities, too. Says it’s open source hardware too.